UPDATE 2: I have been sent a different link for the purchase of tickets. I do so hope you can go if you are in the area. Here is even more information about it in the email that the Texas Leadership Coalition sent out last night. That is a wonderful group and I highly recommend subscribing to their newsletter even if you are not in San Antonio. It covers topics relevant to you regardless of where you are geographically. UPDATE: Here is a place to purchase tickets for this event. I mentioned in my last two posts about the Healthcare in Crisis Conference in Allen, that there would be one in San Antonio. Information about it is now available here, but online registration is not yet open. I will post an update when it is, but please save the date if you are in that area or can travel to attend. The Conference in Allen went well and our feedback was entirely positive. I would expect nothing less from this Conference. 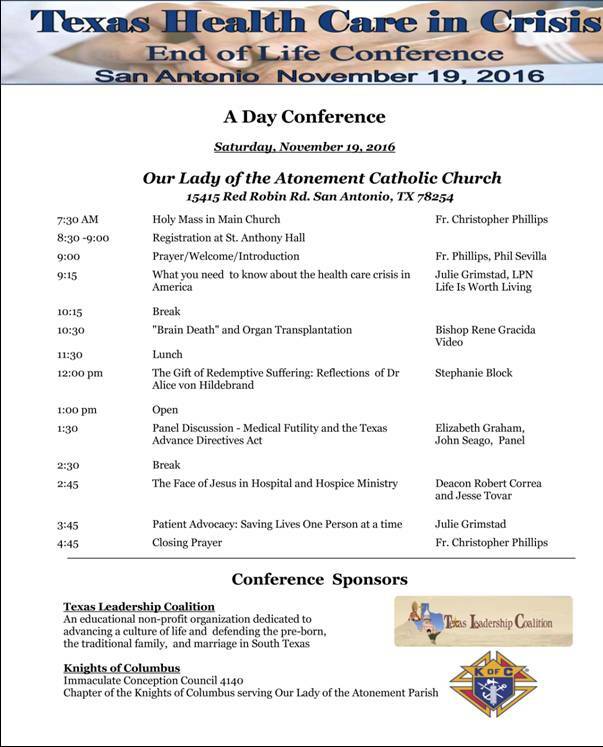 The San Antonio Conference is sponsored by the Texas Leadership Coalition, which is headed by Phil Sevilla, and the Knights of Columbus. Phil is another among the salt of the earth people I mentioned meeting when I got involved in this particular pro-life battle in 2013. He is a faithful, thoughtful person who works hard to bring light and truth into this world. This Conference will address some different aspects of this pro-life battle raging within healthcare and end-of-life issues. You should pay special attention to Bishop Gracida's presentation about "Brain Death" and Organ Transplantation. "What is the connection?" you may ask. PLENTY. Bishop has written about this extensively on his blog. I am also very excited to see a presentation on the gift of suffering. The very definition of euthanasia is to end suffering by killing the person. But that is immoral and you need to understand why and have a deeper understanding of this topic. I have long wanted to do a series of posts about redemptive suffering, but have yet to have time to study in the depth I need to to write about it. Nevertheless, I am convinced that until people understand that suffering has a purpose - not for it's own sake - but for the sake of one's soul - that the war against creeping euthanasia and doctor assisted suicide will be difficult, if not impossible, to win. Even in the Catholic Church we hear very few talking about this although it remains our teaching and that of the Bible. Texas Right to Life will again be represented in this Conference and they are always full of timely information about what is going on right now in Texas hospitals. They are the only statewide pro-life organization to help patients and families navigate the deeply flawed Texas Advance Directives Act which gives hospitals the right to withdraw care against your or your family's wishes whether you have an advanced directive or not. So many are unaware of this. But you need to be. Julie Grimstad of the Pro-Life Healthcare Alliance will be speaking and she has a great deal of experience helping people all over the nation who would be euthanized were it not for her advocacy. As I have written before, these are not hypothetical, academic discussions. Involuntary euthanasia is happening in this nation and in this state right now, but this is only the beginning. A more aggressive agenda is afoot and we see it manifesting faster in Europe. This will not stop without you being aware, informed, and involved when there are opportunities to be. Those opportunities will likely be coming up in 2015 when the Texas legislature meets again. Stay tuned....but in the meantime keep reading, praying, and supporting truly pro-life representatives.